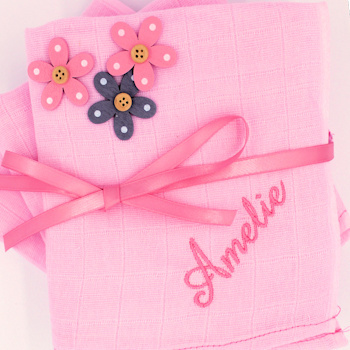 Gift Set of 3 pink natural cotton muslins squares beautifully embroidered with baby's name across one corner of each. Gift Set of 3 pink natural cotton muslins squares beautifully embroidered with baby's name across one corner of each. Unique and very useful gift set for mothers and their babies.